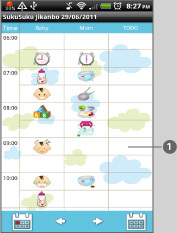 GalleryApp Time-management Log "SukuSuku Jikanbo"
The collaboration project with a time-management specialist Nami Arakawa finally released! What moms want is more time! Mom who has a baby is too busy for childcare and house chores. Busy mother can't go out anytime she wants or relax. The baby needs to be breast-fed and changed diapers morning, noon and night. SukuSuku Jikanbo is just for those moms! 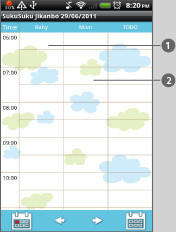 Keeping track of time-management log “Jikanbo”, you will see the quality use of time that you are not usually aware of. Creating the log is very easy! Just tap a cell of the time-line and select an icon of baby's and mom's behavior. 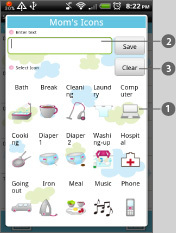 You can save what you want to do in TODO-line when baby's sleeping. 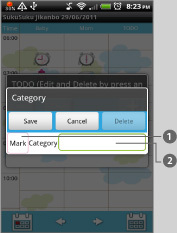 When you have done what you saved in TODO-line, add ◯ mark on the icon, add ☓ mark when you couldn't have done. By comparing baby's and mother's behavior, you will understand when is the best time to do things for yourself.You will get the knack of how you manage your time better by using this SukuSuku Jikanbo! Added a new backup function Export Cloud! You can save, send and retrieve your data by using "Gmail" and "Google Drive". Please click Here to check the detailed description. ❶ 「Base Setting」：Select the display of the timeline. “Today” button：Go back to today’s date. “Left” button：Move the date to left. “Right” button：Move the date to right. “Jikanbo” button:Move to the “Jikanbo”screen. 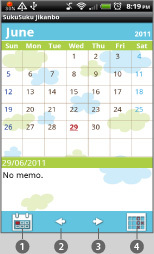 Press “Jikanbo” button of the calendar to move to this “Jikanbo (time-management log)” screen. 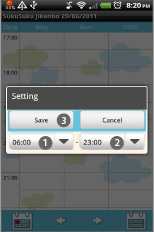 Press “Menu” first then select“Base Setting” to set the display of the time-line hours. When you finish selecting the time, press “Save”. 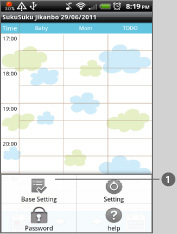 Let”s add baby’s behavior icon first in the time-line. Tap a cell of Baby’s time-line. 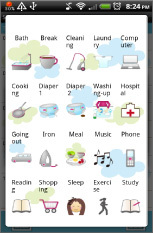 Tap a cell of Mom’s time-line, when you want to add mom’s behavior icons. Select an icon → it will be saved in the time-line automatically. You can save text as well. Press “Save” after entering the text. When you want to delete the icon you saved in the time-line, tap the icon you want to delete→then tap “Clear”. This is the image when you saved the icons. When baby’s sleeping is the only free time for moms. Les’s do something for yourself! 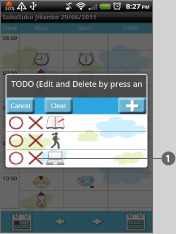 Save TODO icons in the TODO time-line! Tap a cell of TODO time-line. This pop-up window will appear. First, tap this “Add” button. Then another pop-up windowappear. See left below image. When you want to delete the icon you saved in TODO time-line, tap the icon you want to delete→then tap “Clear”. When you can't find the icon that you want, you can enter text here insted. TODO icon list. Select an icon then move to the Calegory screen. 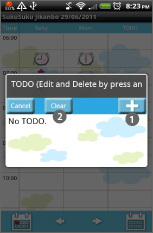 When you select a TODO icon, you see this pop-up window. You can confirm the icon you selected is displayed ①. Press “Save” to add the icon in the list. You can see the icon added in the list ①. 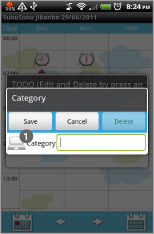 If you have several icons in the list, you choose one and tap the icon to add in TODO time-line. ＊If you don't tap the icon here, it will not be added in the TODO time-line. You can confirm the icon added in the time-line ①. Have you done what you wanted to do? When you have done, tap ◯, when you couldn’t have done, tap ×. Tap here ◯ or ×, these mark will be displayed on the right-top corner of the icon. You can see ◯ here. ＊By comparing Baby's behavior, Mom's behavior and TODO icons, check where you eat up so much time. Then you can think the better use of time for the next day. 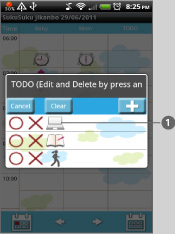 “Calendar" button：Go back to the calendar. When you go back to the calendar, you can see saved icons in the list ①. When you save something on“Jikanbo” screen, those marks will be dispalyed on the date. “Mark” button: You can add other mark on the date. ＊You can deleter the markyou add by tapping twice the same mark.